Recently, a friend’s daughter was watching me prepare a tomato, avocado, basil salsa. As I diced up the avocado I saw her eyes widen as she enthusiastically told me how much she loved avocado. Later that day as the guests mingled while gathered around the appetizers, I noticed that my friend’s daughter was huddled at the salsa dish, carefully selecting and piling on the avocado from the salsa on her taco chip. Now that’s love! As an adult, don’t you wish you could do that sometimes? Avocado is more than yummy. It has well documented, amazing health benefits and continues to be a topic of study for health researchers. The more we read about avocados, the more we want to include this fruit into our meals. Did you know that avocado is a classified as a fruit? In the botanical world, they classify it as a fruit because the avocado grows from a flower and has a seed. Most of us use it as a vegetable so in the culinary world, it is considered a vegetable. 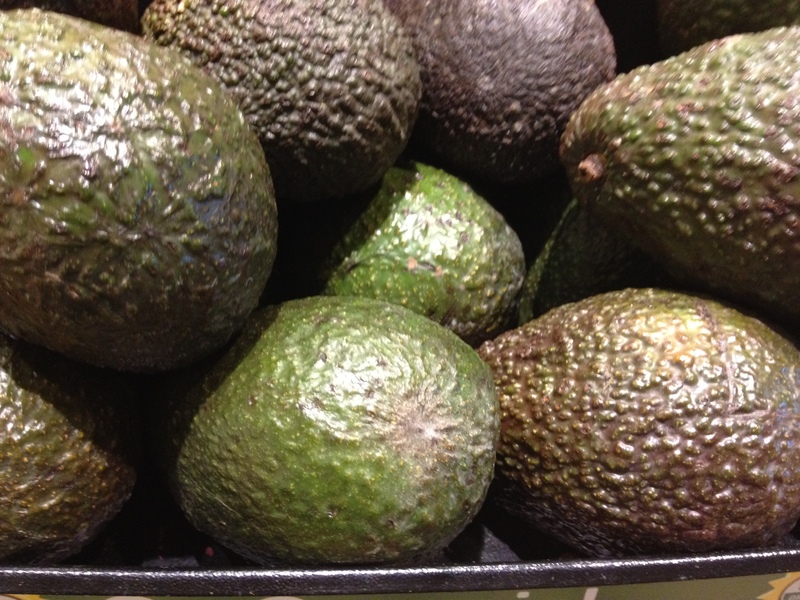 An alternate name for the avocado is Alligator Pear because of its shape and scaly skin that resembles an alligator. The indigenous people of Mexico, Central and South America have eaten avocados for thousands of years, and it is believed the avocado originated in Mexico more than 10,000 years ago. 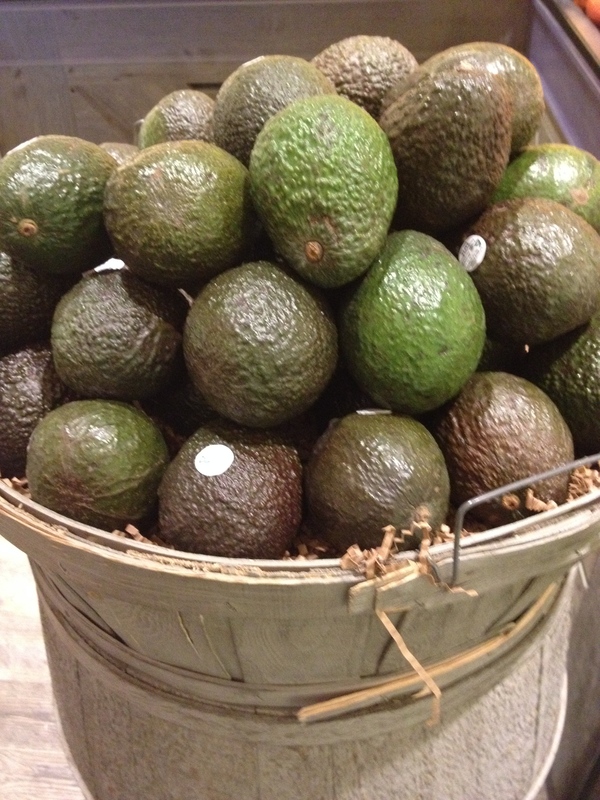 The Spanish Conquistadors introduced Europeans to avocado after having travelled to Mexico during their explorations. Today, several varieties of avocado are also grown in North America, primarily in California and Florida. Depending on its type, an avocado could weigh from 8 ounces to 3 pounds! 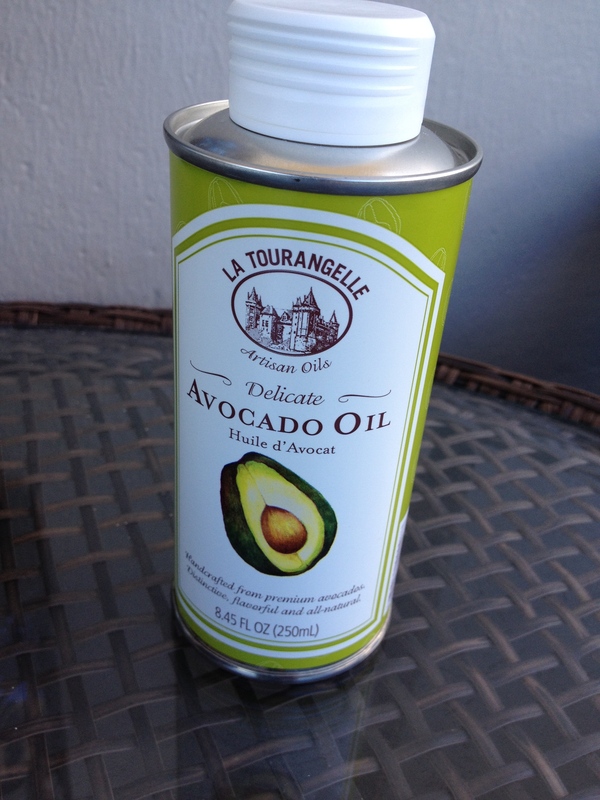 Avocado oil is also produced from avocados, and is becoming a popular oil for high heat cooking or for simply drizzling on salads or other prepared meals. The oil has many of the same health benefits of the fruit. Besides its great nutritional value, what we like about avocado is that it does not need to be cooked. In fact, you can diminish the nutritional benefits of avocado by cooking it because high heat and prolonged exposure to heat can damage its healthy fat content. As well, the greatest concentrations of carotenoids are in the green flesh of the avocado that’s closest to its skin, so when removing the skin, you want to peel it away rather than cutting it off. Avocados are high in calories with about 240 packed into 1 cup of avocado (150 grams). The high calorie count is due to its fat content, which is primarily from oleic acid, a monounsaturated fat — the good kind! If you are watching your weight, enjoy avocado in moderation. Interestingly, avocado has a relatively small amount of carbohydrate (19% of total calories) and is considered a low glycemic food. Vitamins K, B6, E and C.
Avocados have several properties that give anti-inflammatory benefits including phytosterols, carotenoid antioxidants, other non-carotenoid antioxidants, omega-3 fatty acids, and polyhydroxylated fatty alcohols. When combined with its antioxidant properties, avocado’s anti-inflammatory effects may also help prevent some types of cancers. Healthy monounsaturated fats (oleic acid) of avocado and its high fiber content contribute to lowering bad cholesterol and lowering the risk of heart disease, stroke and other cardiovascular problems. Its high source of Vitamin E helps with heart disease and slows aging process. With wide variety of vitamins and minerals present in avocado, it contributes to overall physical health. Its high folate content helps healthy tissue and cell development. Another major benefit of eating avocado, whether fruit or oil format, is that it improves the absorption of carotenoids contained in other foods. For example, if you add avocado to a spinach salad, you will get more of the carotenoids from the spinach. The reason may be that carotenoids are fat soluble and therefore the fat in the avocado helps to absorb the carotenoids. Sweet! Now we can combine all the things we love and get even more out of the meal! When you’ve got a ripe avocado on hand what do you make with it? We bet most of you said, “Guacamole, of course!” If you want to expand your culinary skills with avocado, there are hundreds of recipes you can try. 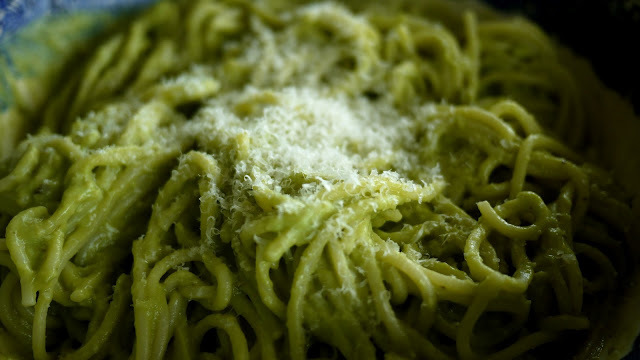 It tastes creamy and a bit like an Alfredo Pesto Sauce. The next featured recipe is from My Recipes and was originally published in Cooking Light. It’s a standard avocado salsa recipe that we should all have on hand. 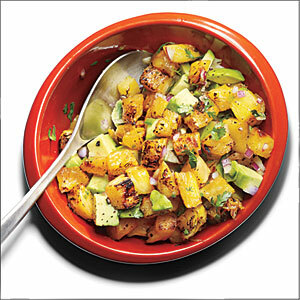 It is sweetened by grilled pineapple with a bit of honey. Delicious! 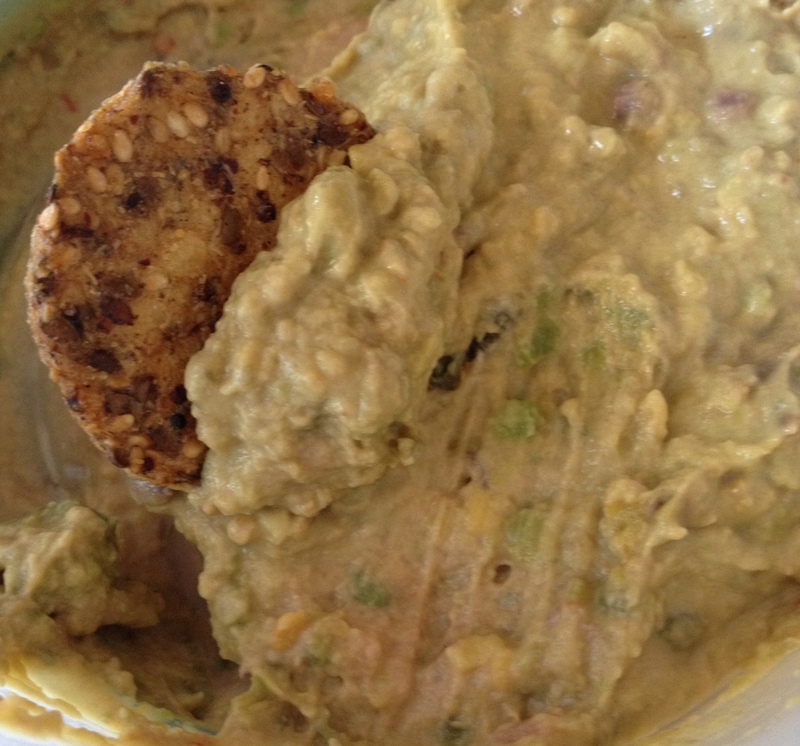 This entry was posted in Recipes, Weekly Blogs and tagged antioxidants, avocado, carotenoids, guacamole, heart health, inflammation. Bookmark the permalink.